The colours in this “Essential Colour” set include Cherry, Cayenne, Pumpkin, Dutch, Saffron, Pistachio, Basil, Beach House, Sapphire, Empress, Grape Jelly and Raspberry. Colour fever has hit SweetGeorgia and we’ve been playing with hues and creating our own colour palettes. In the process, we’ve made this very special “essential” colour mini-mini yarn set! 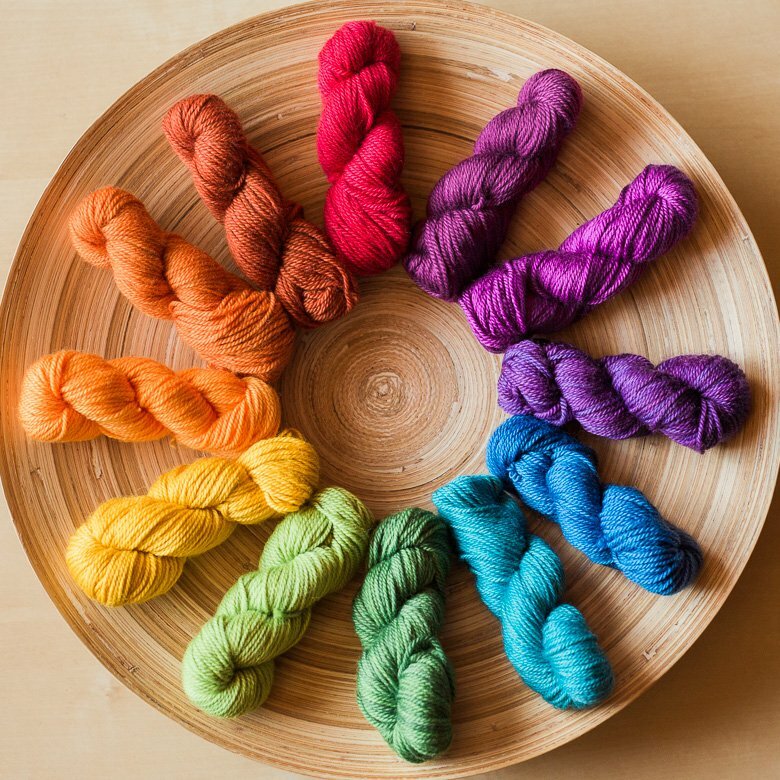 This set contains 12 colours of Tough Love Sock, each approximately 50-52 yards for a total of at least 600 yards. What’s a “mini-mini skein”? It’s half the size of our Party of Five mini-skeins! The colours in this “Essential Colour” set include Cherry, Cayenne, Pumpkin, Dutch, Saffron, Pistachio, Basil, Beach House, Sapphire, Empress, Grape Jelly and Raspberry. These will look great together in one big rainbow-coloured project or break them up to add accents to your other knit projects.